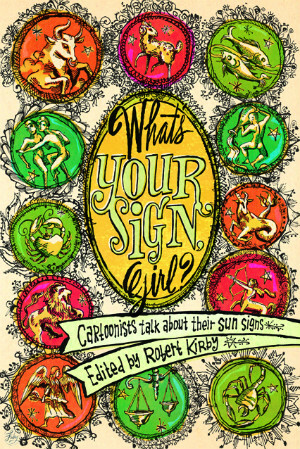 Edited by indie comics stalwart Robert Kirby, What’s Your Sign, Girl? 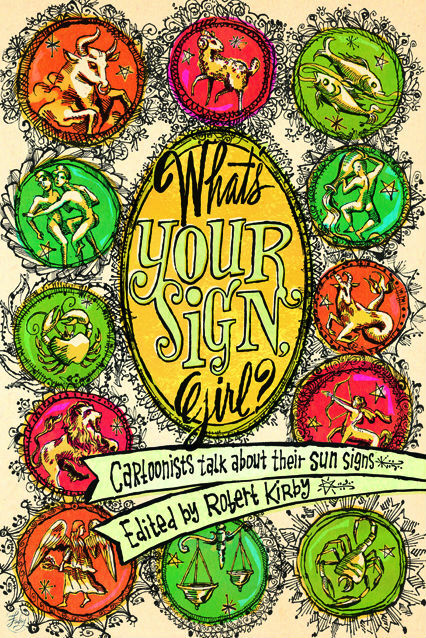 gives twelve cartoonists the opportunity to examine their relationships with their sun signs in a selection of short stories that cover the entirety of the Zodiac. Each artist’s approach ranges in tone from ardent belief in the accuracy of astrology to a more sceptical and questioning view of the topic. 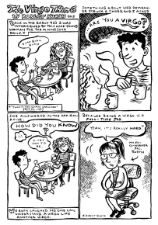 It includes work from a number of US indie creators whose comics have had positive reviews in this column over the last couple of years or so, including Kevin Budnik (Our Ever Improving Living Room), Cara Bean (Ms Bean’s Art Class), and Delaine Derry Green (Cringe: An Anthology of Embarrassment). If your immediate reaction is to dismiss the book on the grounds of its subject matter then you’re doing yourself a disservice. While Kirby’s enthusiasm for astrology as some form of social belief system may leave those who subscribe to a more rationalist view of the world scratching their heads, the amiable tone of his foreword remarks leave the reader in no doubt that to all intents and purposes astrology is simply a springboard for the artists involved to launch their sometimes funny, often thoughtful mini-narratives from. 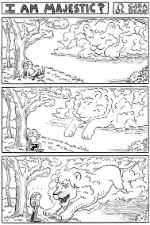 Admittedly, many of the contributors take the perhaps obvious route of directly relating the attributes of their signs to their own daily existences or past history. Delaine Derry Green (below left), for example, provides not so much a structured narrative as a series of observations that graft personal experience onto the traits of Aries. Green’s almost chalkboard-style visual catalogue of her relationship with the first Zodiac sign is appealingly personable and chatty though, and engages the reader instantly despite the briefest of page counts. If you’re a fan of Kevin Budnik’s diary comics then you will be pleased to know that he continues in a similar vein here (below centre) juxtaposing a Taurean forecast with events in his daily routine with his usual wonderfully self-deprecating schtick. Kirby himself examines his Virgo tendencies (or perhaps even neuroses, below right) in a busy, frenetic strip that, in its frantically crammed panel-to-panel layouts, is a suitable reflection of its narrator’s buzzing mindset in delivery. 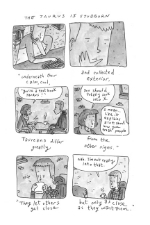 Tyler Cohen (top banner image) adds an extra layer of resonance with a piece of autobio comics that uses the 1970s resurgence of astrology as a focal point in seven progressively more cluttered and chaotic pages that ably mirror both her resentment towards, and grudging acceptance of, the sign of Cancer. 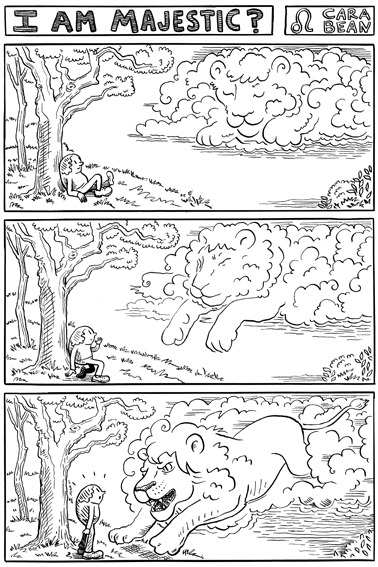 But it’s the comics that stretch the book’s core concept a little further than “my life as a [insert Zodiac sign here]” that prove to be the most interesting uses of the form. 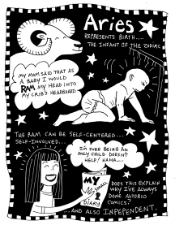 Cara Bean’s moment of astrological spiritual epiphany for example (below left), or Rick Worley’s clever comparison/contrast of astrology and obsessive compulsion (below centre) which proves to be one of the true highlights of What’s Your Sign, Girl?. 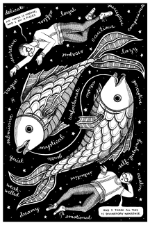 Aron Nels Steinke’s tale of rejecting the strictures of the Aquarian viewpoint has an amusingly liberated vibe while the most pensive tale in the book – and a fitting story to end on given that it manages to turn full circle with a neatly paced punchline – is Marnie Galloway’s flowingly rendered Piscean piece that sees a flirtation with near nihilism evolve into a clever commentary on the human condition (below right). Collections like this are always more of a draw for me for their roster of artists rather than necessarily their topic. As mentioned, What’s Your Sign, Girl? does, perhaps, suffer from a surfeit of entries that – however readable they may still be – are essentially simply lists of how particular Zodiac signs relate to their creator’s worldviews. 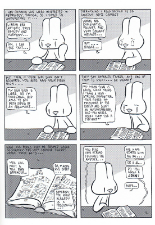 But there are some true gems here that tackle the subject matter from alternative, more playful angles. 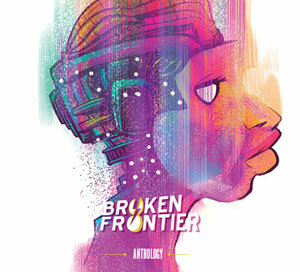 And even if you do feel astrology is pure hokum there’s no denying that this is an excellent primer for the comics of a dozen artists whose work most assuredly deserves your further exploration! You can order What’s Your Sign, Girl? here priced $10.95 plus postage. For more on Robert Kirby follow him on Twitter here. Tags: aron nels steinkecara beandelaine derry greenkevin budnikmarnie gallowayrick worleyrob kirbyrobert kirbytyler cohenwhat's your sign girl?